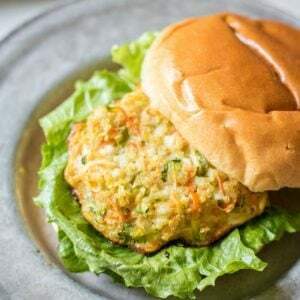 Veggie Packed Quinoa Burgers: Quinoa patties are seasoned with cottage cheese and fresh vegetables for a hearty, healthy, high in protein alternative to a burger. Gluten-Free. Meatless. Are you as obsessed with quinoa as I am? This grain is a gold mine. Yes, a true super food! Quinoa is a complete protein, more full of protein than just about anything we eat. It also contains almost twice as much fiber as any other whole grain, to keep your digestive system happy. It also has so many essential vitamins, like iron, maganese, and vitamin B12. Not to mention, quinoa is gluten free. 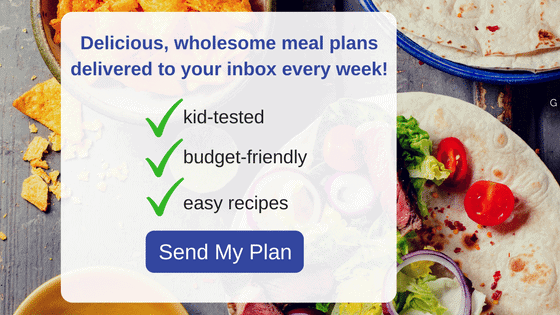 So now that I have you hooked on the fact you should be eating this healthy grain, let me tell you it is delicious in just about any way you prepare it–sweet or savory. 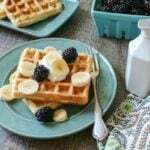 I use it anywhere I would use rice–in Spinach Lemon Quinoa Salad, as a base for a warm breakfast in Banana Nut Porridge, and even as a delectable treat like Quinoa Brittle. Or bring water to a boil and simmer quinoa for 20 minutes on the stove. Once quinoa has cooled, mix together with cottage cheese, egg, veggies, and seasonings. Line a baking sheet with silicone mat or grease well. Scoop 1/4 cup of burger mixture onto prepared pan. Use your hands to form into patty. Bake for 20 minutes on one side. 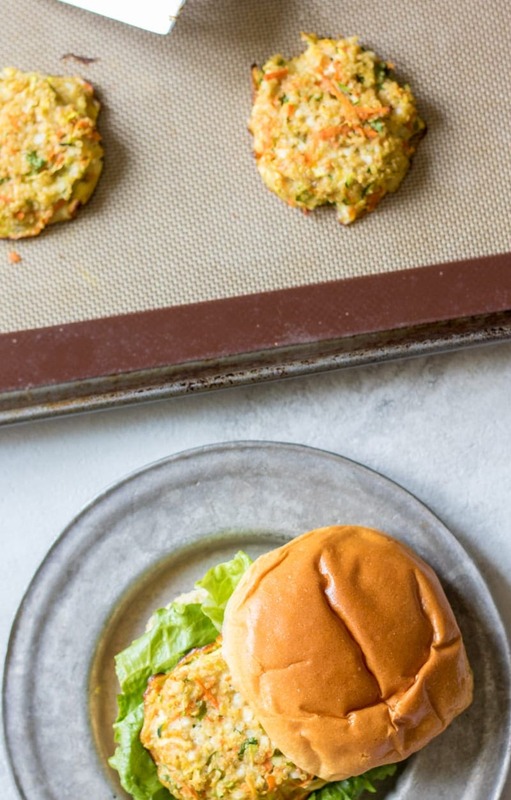 Flip burgers and bake for an additional 10-15 minutes. To keep these Quinoa Burgers gluten-free, serve on a lettuce wrap or gluten free bun. I like to freeze leftovers on a parchment lined cookie sheet until burgers are frozen solid, then I remove from baking sheet and place in freezer safe bag and then grab one out as needed. To reheat frozen veggie burger, place on plate and microwave for 1-2 minutes. 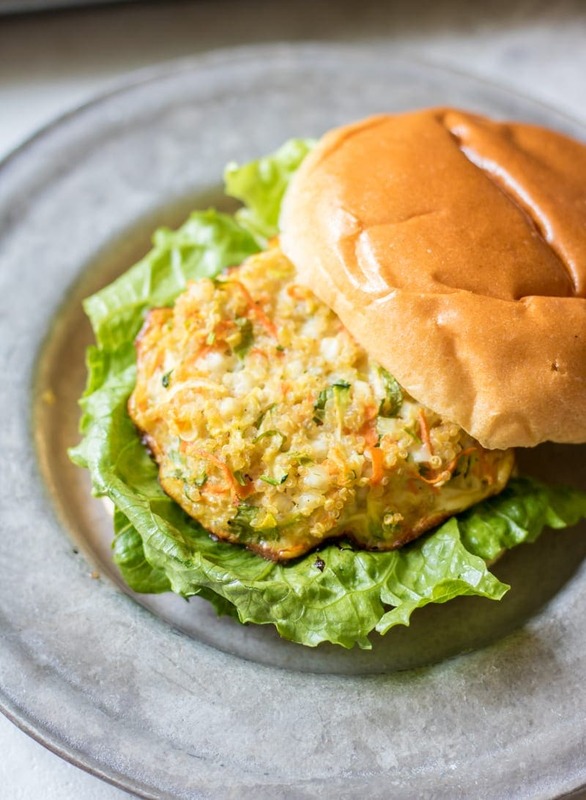 You can use any vegetables you like in these burgers: Mushrooms, yellow squash, and broccoli slaw are good options. Want to know how to perfectly cook Quinoa? 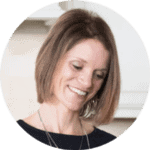 Check out this guide from Veggie Balance. Veggie burger made with quinoa, veggies and cottage cheese. Prepare quinoa. To obtain 2 cups you will need to cook 1 1/2 cups dry quinoa. Have extra? Freeze it!! Let quinoa cool. Mix eggs, seasonings, cottage cheese, parsley and carrot together in large bowl until well combined. Add quinoa and thoroughly mix. Grease a large sheet pan or 2 cookie sheets and scoop 1/4 cup of mixture unto the tray, forming 12 mounds in total. Using wet hands, form into a burger shape. Spray with a cooking oil on the top of burgers. Bake at 425 for 20-25 minutes on first side and flip and return to oven for 15-20 minutes. I have to try this and share it with my parents (who eat vegetarian all the time now). This looks and sounds really delicious. Mom was a vegetarian all my live and while I am not, I crave vegetarian foods liks this. Thank you for sharing! Thanks for sharing with Christy Jordan’s Southern Plate.